2008 was the last time that the Bugs Bunny Retro 8's dropped. Even though it is not as long seen a release as other Retro models it is still a classic Retro that will surely have many sneakerheads lining up for a pair. The shoe itself is very similar to that of the CDP Release pair with little to no differences. Those that still have a fresh pair of 2008 CDP 8's may skip this release due to the non change in materials or style. Check out the detailed images below let us know if you will be copping a pair of these classics. For years this shoe has been photo-shopped with the What If's ? Never would we have imagined that many of our dreams will come true. Earlier this year TCC was the first to bring news of this release and also gave you a very detailed Photoshop picture. JB will be dropping the Classic Grape Retro 5's this year but they will also be Dropping Aqua 5's. 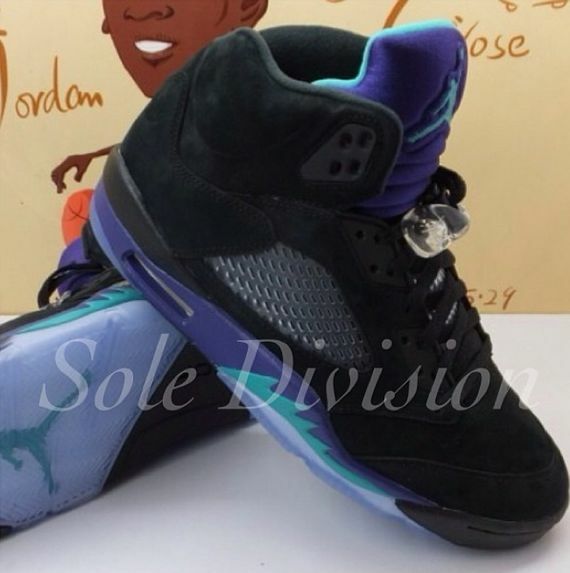 The Aqua 5's feature some of the same features as the Grape's but one big difference is the Aqua 5's will come with a very nice black suede upper. 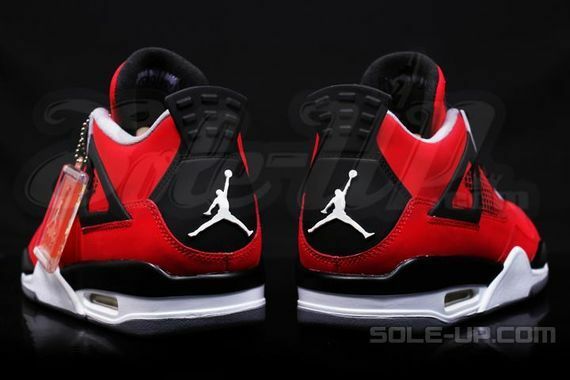 Material used is similar to the very nice suede used on the Bred 4's that dropped Black Friday 2012. How do you feel about this new Retro 5 colorway for 2013. Stay tuned for a exact release date for the Aqua 5's. When this strange colored Spiz'ike first popped up we thought they may be a GS colorway because of the strange use of colors. But now that a release date draws near and the Easter Holiday we now know that these Colorful Spiz'ike's are part of the JB Easter Pack. The upper consist of a suede grey upper and a mixture of blue , yellow and PSN green. JB introduces these colors very nicely and even throws in hints of patent leather throughout the shoe. Look for these Spiz'ike to Drop IN April. The New Nike hybrid that combines multiple Barkley models has made a huge hit already in the sneaker market, with the first Area 72 colorway selling out in secs the second Eggplant colorway set to drop this weekend looks to also be a instant sell out. But Nike isn't done yet with the Sixers colored being previewed early here we bring you the first look at the Cyber Blue/Pure Platinum colorway. The foamposite out sole gives the shoe that platinum look while the blue upper has cyber blue splashes. This colorway blends together very well. Stay tuned for more information on this New Barkley Posite colorway including release date. After the success of the Jordan 11 Low "Bulls" last year JB decided to bring back the 11 Low. Not the concord or Bred lows that we have been expecting for a long time now but non the less a classic colorway of course featuring the red black and white. The shoe closely resembles that of the Bulls version last year replacing white mesh for black and the red bottom for a icey blue bottom. How do these fetch up in your eyes? Do you prefer the bulls of last year or the bulls alternate of 2013? Stay tuned for more release info on these. TCC First leaked images of the 2013 Jordan Retro 4 "Toro" first thought to be suede the shoe actually turned out to be a nubuck similar material of that of the Jordan 4 Thunders that released in 2012. That has many sneakerheads disappointed but regardless this are still making a major splash on the release mill. The upper is all red nubuck with hints of cement grey and white. The color combination goes real well with this release. How do you feel about this upcoming Jordan 4? Jordan brand still going strong with the retro 4's even after the 23rd anniversary last year. Been 6 years since Jordan Brand dropped the fan favorite Jordan Retro 8 "Playoffs" but soon you won't have to wait much longer. Already a jammed packed and heat filled Holiday season Jordan Brand will be throwing in the Jordan 8 Playoffs into the mix. Staying true to its OG and 2007 Roots the Shoe seems to exhibit all the colors that made it popular the first 2 times. 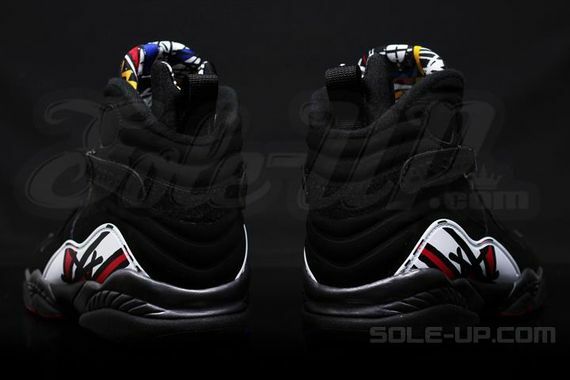 Im sure many sneakerheads will be in line brought and early for this release. What do you think of the 2013 Jordan Retro 8 "Playoffs" Your thoughts TCC Fam? Stay tuned for more release info. TCC first broke the news of the Jordan Retro 5 "Black Aqua" The shoe is almost identical to the Grape 5's releasing in May except for one big factor. The one releasing holiday 2013 Will feature a all black suede upper instead of a white leather upper. We had received conflicting reports that the color may be slight diff but Now know the other Color is GS version. What do you think of JB adding black suede to classic JB colorway. Don't forget to stay tuned for more updates on this release.